I had a busy busy Sunday. 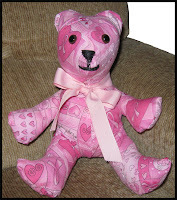 I whipped up a second bear using using a new pattern. This time I used McCall's Craft's Pattern M5605. It was easier than my first but I am not too fond of the pointy nose. It only had 4 pieces instead of 10. This time I used real teddy bear eyes. Each time I'll get better. Not sure what I'll do with all the experimental bears along the way. This one is 8" tall. I finished the border on a T-Shirt quilt I am working on for a friend. 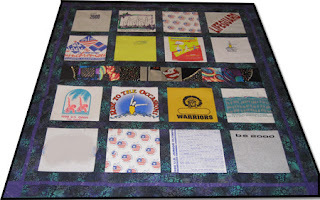 The T-Shirt quilt has a band of squares in the middle that are made up of swimsuits. I just backed them with interface like I did with the T-Shirts and they cut well without stretching. The person was a synchronized swimmer. I blurred some of the TShirts because there were names on them. I used an offset corner block design for the corners. Finally, I made Chili. That's a big feat for me. I am been frequently visiting a certain fast food chain for their chili. I thought, a similar recipe should be out on the internet somewhere. 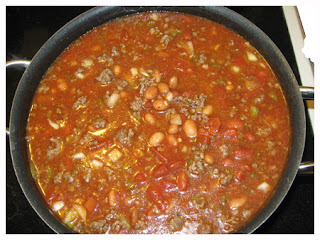 I found this recipe for Wendy's Chili (oops, I spilled the beans) on the internet. I bought diced tomatoes and chili's in a can. I used 1 & 1/2 cans of them instead of the tomatoes. I also added a small extra can of diced green chilies. It is really good. Tastes pretty close to the original. However, it made a large pot. I'm going to have to freeze some of this!